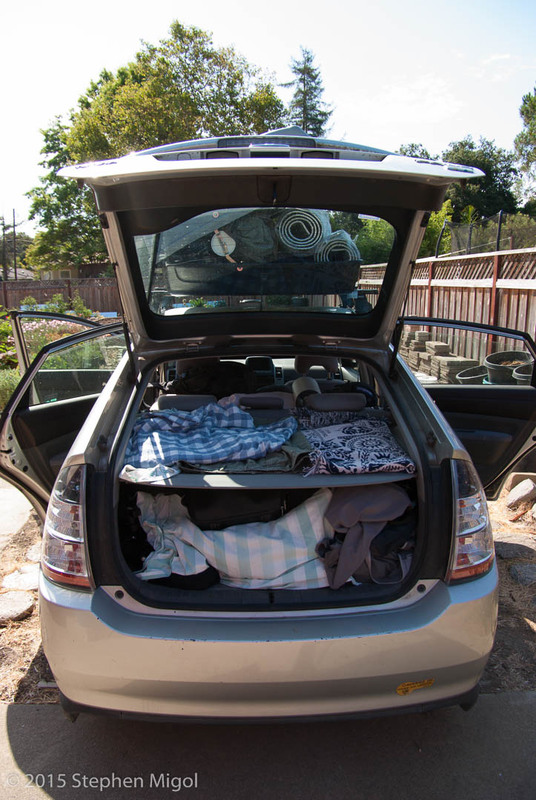 It was the first time I used the roof rack on the Prius and it was a success! 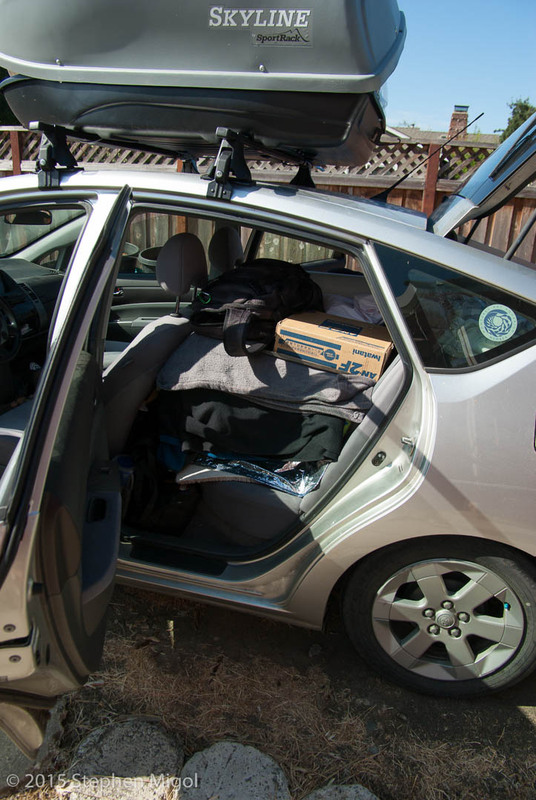 The car is seen in these pictures after the trip and before I unloaded it. The back hatch area is still holding all the scope stuff. 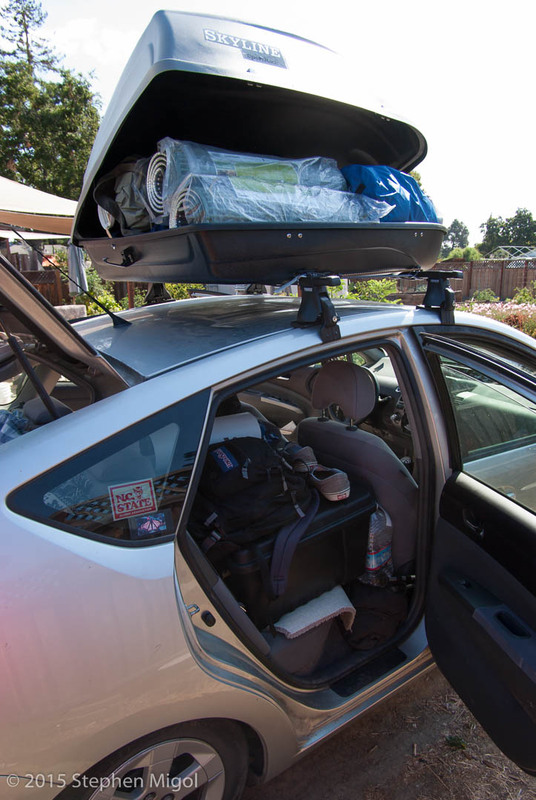 The roof box holds the tent, cots, sleeping bags, and pads. The main back seat holds two black cargo boxes and the cooler, plus lots of small bags for clothes and food items. I brought 7 gallons of water, used all but two (as they were frozen in the cooler), and needed to get another 5 during the trip. Note how low the back wheels are riding. On the way up, the car was bottoming the suspension on road dips. 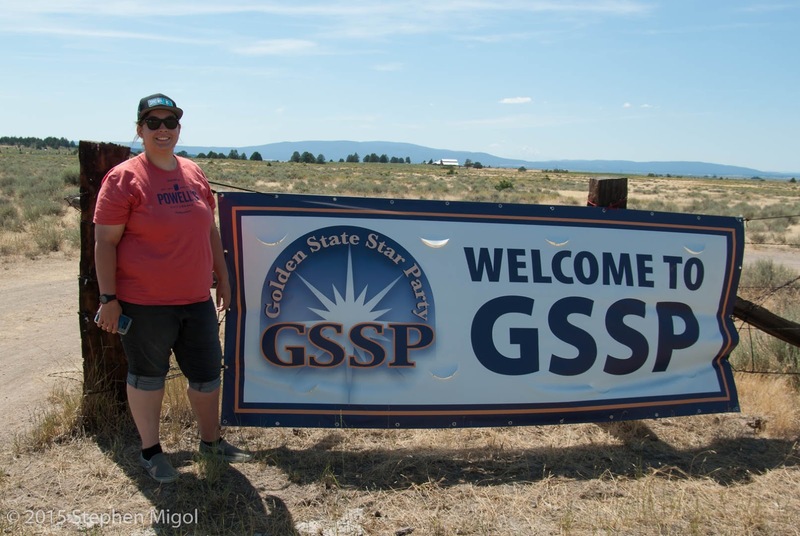 On arrival to GSSP, the car pan scraped the rise between the wheel ruts. This required careful driving to ensure that road hazards were avoided since the car was so heavily loaded. Even with all this, the overall mileage for the trip was about 35 mpg. Not too bad! The trip included a first night in Lassen Volcanic National Park. I plan to return to this area as it was very interesting and I'd like to go back to spend more time. My niece Rebecca took to star gazing and star hopping like a duck to water. 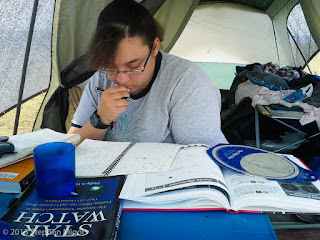 Her hobby of puzzles gave her some background with pattern matching problems and she really enjoyed the challenge of looking at the star charts and hopping around with a wide field eyepiece. She was working her Messier list and was able to view quite a few objects between the the SV70ED and the Fujinon binoculars. GSSP weather turned out to be a little unpredicatable. The first nights were great for clear skies, then we had thunderstorms, then a final night of chasing sucker holes. On Friday night, the weather was calling for an early chance of rain, followed by clearing skies. 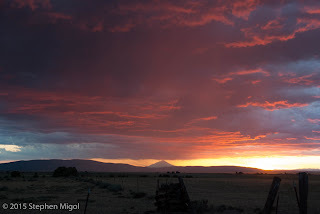 Rich Ozer made a comment at dinner that if the sky looks like you're walking into Mordor, it might be a good idea to cover your gear. Rebecca noted the fuzzy clouds and wondered what they were. I said, that's rain, but it's so dry that the drops aren't reaching the ground. It may blow over. Many people were captivated by the sunset and were taking pictures, including myself. Soon, we started feeling drops of rain. Then there was a mad scramble to cover equipment. Luckily, the SV4 only needs two wires removed to get it off the mount as a single unit. All was covered quickly and we were able to consolidate the camp for a wet and windy night ahead. No stargazing that evening!